Karaite grammarian and liturgical poet; died at Jerusalem, where he was rosh yeshibah,in 932. He was the author of a grammatical work entitled "Me'or 'Enayim," in which he divided the Hebrew nouns into thirty-five classes (see Hadassi, "Eshkol ha-Kofer," alphabets 173, 257). Pinsker ("Liḳḳuṭe Ḳadmoniyyot," p. 5) supposes that the scholar of Jerusalem mentioned by Abraham ibn Ezra at the beginning of his "Moznayim" as author of eight grammatical works was Judah b. Eli. He wrote also two piyyuṭim (Karaite Siddur, iv. 119), and a dirge on the ruin of Zion containing an acrostic on his name (Pinsker, l.c. Supplement, p. 139). Judah is identified by Dukes ("Ḳonṭres," p. 2) and Abraham Geiger ("Oẓar Neḥmad," ii. 158) with the 'Ali, or Eli, b. Judah ha-Nazir quoted by David Ḳimḥi in his "Miklol" (ed. Fürth, p. 90b). The identity of Judah b. 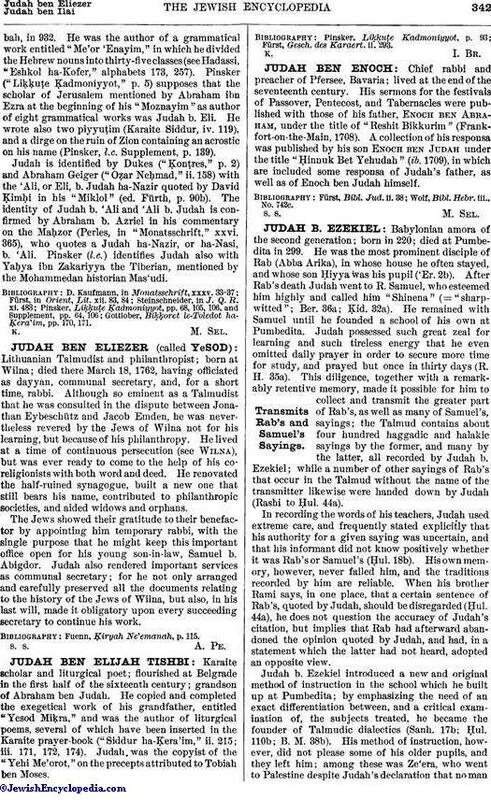 'Ali and 'Ali b. Judah is confirmed by Abraham b. Azriel in his commentary on the Maḥzor (Perles, in "Monatsschrift," xxvi. 365), who quotes a Judah ha-Nazir, or ha-Nasi, b. 'Ali. Pinsker (l.c.) 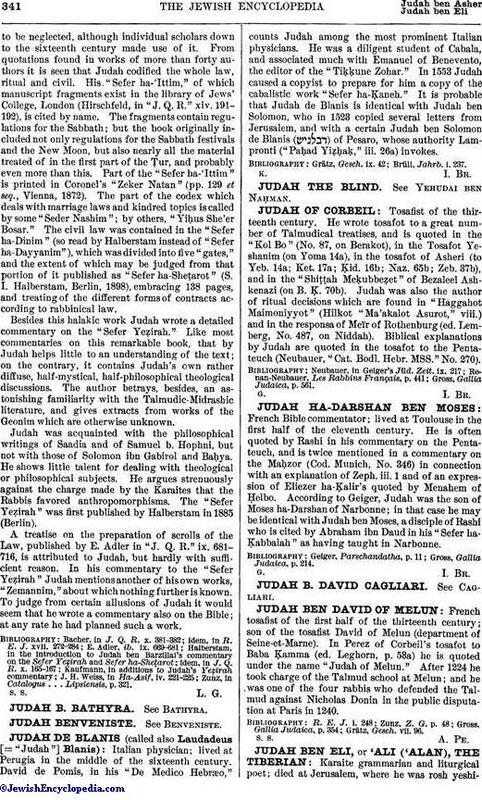 identifies Judah also with Yaḥya ibn Zakariyya the Tiberian, mentioned by the Mohammedan historian Mas'udi. Gottlober, Biḳḳoret le-Toledot ha-Ḳera'im, pp. 170, 171.